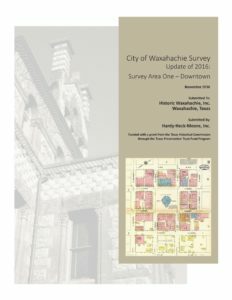 Over the years Hardy-Heck-Moore, Inc. has made historical surveys of the Waxahachie downtown and surrounding area. Information resulting from these surveys in 1985, 2004, and 2016 is provided here. The links below are to information concerning the earlier surveys. The remainder of this page goes into detail into the latest survey which occurred in 2016. In 2016 Har dy-Heck-Moore, Inc. conducted a survey of the downtown area. The survey was funded with a grant from the Texas Historical Commission through the Texas Preservation Trust Fund Program. The grant was secured by Historic Waxahachie, Inc. (HWI). Additional funds were provided by the City of Waxahachie. The results of that survey are accessible from this website. The first link below is the survey itself. That document references two appendices (“A” and “B”) that contain information on specific properties surveyed. Because of size those files are split out separately and found here on the HWI website (see below). The second link points to a file that is on the City of Waxahachie’s website and is a detailed city-wide survey plan for possible action in the future. Appendix A: Close to 150 properties in the downtown area were surveyed. A map of the boundaries of the survey can be seen by clicking the link above. An inventory of surveyed historic resources (Appendix A) provides a thumbnail description and small picture of each property and some of its historic characteristics. It is a small file (13 pages) and is ordered by street and address. One can fairly quickly review it to determine what properties were surveyed. Click on the link below to access it. Appendix B: The collection of Texas Historic Sites Forms (Appendix B) has been separated by property address and is accessible below by street. You can use the links on this website to access specific property addresses contained in the report. By clicking on a street name below you will be taken to a separate page which will list the addresses on that street which were surveyed. You may then click on the address to access the site form for that property. It will contain current and in some cases historic pictures, along with more detailed information about the property and its history. Below are listed the streets that were a part of the 2016 downtown survey. Click on a street to find the property addresses that were included in the survey.